Active full length recombinant mouse N-terminal His tagged TDG (Thymine-DNA Glycosylase) protein, produced in SF9 insect cells. 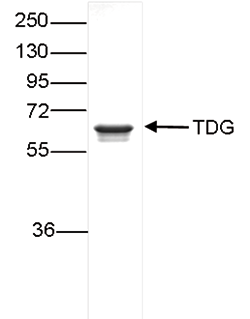 SDS page of the TDG recombinant protein. The position of the protein of interest is indicated on the right; the marker (in kDa) is shown on the left. The Diagenode TDG recombinant protein (Cat. No. C23020101) is a very good tool. I used it as positive control in western blot analysis and during TDG ELISA activity assays. The protein is really active! Indeed the TDG recombinant protein perfectly works in glycosylase activity assays using marked oligos. Diagenode strongly recommends using this:	Recombinant mouse TDG (Diagenode Cat# C23020101). Click here to copy to clipboard.